H I C 5 (1946) The 51 ton 60 foot wooden scow H I C 5 foundered May 10, 1946 at Excursion Inlet. H & S NO 5 (1967) The 198 ton 90 foot wooden barge H & S No 5 foundered March 29, 1967 in Whitewater Bay on the southwest coast of Admiralty Island. HACIENDA (1955) The 11 ton 32 foot wooden gas screw fishing vessel Hacienda was consumed by fire May 23, 1955 in Behm Canal. HAIDA MAID (1958) The 33 foot wooden gas screw vessel Haida Maid disappeared in a snow squall November 18, 1958 near Haines. Wreckage of the vessel washed ashore near Dyea, Sanki Inlet November 29th. Lost was John Lawrence Jr. of Haines. HARVESTER (1955) The 20 ton 40 foot wooden gas screw fishing vessel Harvester burned March 28, 1955 at the north end of Level Island in Sumner Strait. HATTIE B (1942) The 8 ton 32 foot wooden gas screw fishing vessel Hattie B foundered off of Cape Ommaney June 28, 1942. HAZEL (1963) The gas screw Hazel foundered July 9, 1963 east of Hoonah in Spasski Bay. HAZEL B NO2 (1932) The 135 ton wooden gas screw Hazel B No 2 caught fire alongside of the Anderson Boat Shop in Wrangell at 10:30 p.m. Saturday January 23, 1932. The vessel was out of commission and on the ways for winter storage when the casualty occurred. “The Wrangell fire department and citizens did everything in their power to hold the fire in check as well as to extinguish it.” The Hazel B No 2 became a total loss. Weather at the time was “very little wind, if any, light snow falling, weather cloudy and dark.” S C Barrington, owner and master of the vessel, stated in the report of casualty he filed at Wrangell that the vessel was worth $60,000 with $30,000 in insurance. HAZEL I (1950) The 7 ton 32 foot wooden gas screw fishing vessel Hazel I burned on August 22, 1950 between Point Francis and Helms Bay on Cleveland Peninsula. HAZEL LOUISE (2007) The 55 foot fishing vessel Hazel Louise burned to the waterline and sank November 8, 2007 while at anchor in Nakwasina Passage near the northern end of Halleck Island north of Sitka. The master of the vessel was the only one aboard and reported being awakened by explosions, burning wood and heavy smoke. He abandoned ship in a survival suit and swam to nearby Halleck Island. HAZEL M (1951) The 28 foot troller Hazel M broke loose from her moorings at Metlakatla and sank at Driest Point October 1, 1951. HELEN (1917) The 17 ton 48 foot gas screw fishing vessel Helen stranded and was lost near Level Island October 26, 1917. The two crewmen aboard made it to safety. HELEN B (1953) The 105 ton 72 foot wooden oil screw fishing vessel Helen B burned June 9, 1953 half way between Saook Bay and Rodman Bay in Peril Strait. HELEN N (1969) The gas screw Helen N was consumed by fire October 1, 1969 at Allen Marine Ways, Jamestown Bay, Sitka. HELEN PAYNE (1935) An explosion and fire destroyed the 9 ton gas screw Helen Payne in Salmon Bay on Prince of Wales Island at 5:00 a.m. Wednesday August 14, 1935. The crew of three narrowly escaped the violent gas explosion, but the Helen Payne, valued at $1,500 was a total loss with no insurance. They had left Wrangell for the fishing grounds and had no cargo at the time of the casualty. HELGA CAROLINE (1914) The 16 ton wooden gas screw Helga Caroline got off course and stranded in Revillagigedo Channel in the fog at 1:30 p.m. May 9, 1914. The vessel became a complete loss but the crew of two was able to save themselves and the engine of the Helga Caroline. The sea was calm and the weather fair with fog. Henry Roy Thompson, master and owner of the vessel said he “Put ship about, but too late.” The Helga Caroline departed Ketchikan May 8, 1914 bound for Boca De Quadra in ballast with no cargo. 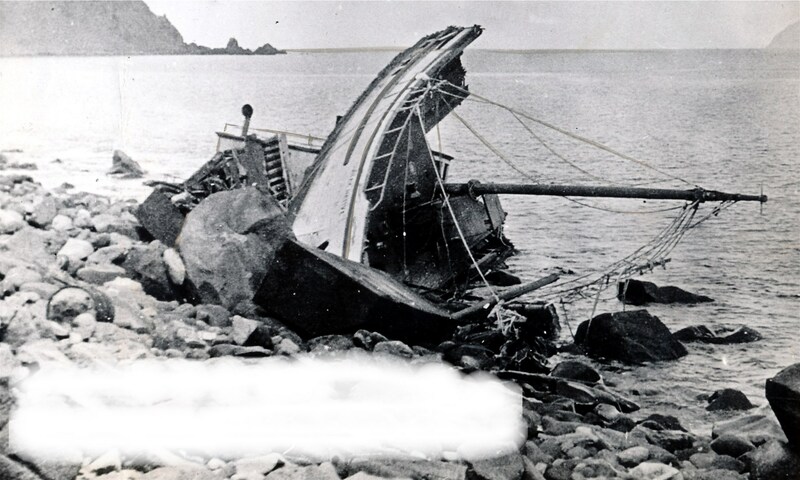 The wreck occurred on the Mainland inside Slate Island. HEREWEGO (1956) The 8 ton 35 foot wooden gas screw fishing vessel Herewego foundered December 3, 1956 off Saint John Harbor, Zarembo Island. HERITAGE (2001) The 49 foot seine fishing vessel Heritage stranded and was lost August 25, 2001 in Hawk Inlet. Master of the Heritage, John P Ancich (34) of Gig Harbor WA, went into diabetic shock and the vessel ran aground. He did not survive. The remaining four crewmembers abandoned ship in a skiff after attempting to revive Ancich. The cruise ship Spirit of Endeavor picked up the crew and a dog from their skiff and transported them to safety. HERMES II (2006) The 50 foot trawler Hermes II sank January 31, 2006 five miles northwest of Cape Decision in Table Bay. The vessel was struck by a large wave that sprung a plank two feet above the waterline while traveling in 10 to 12 foot seas. The only person aboard the vessel abandoned ship to a life raft and was rescued by a U S Coast Guard Helicopter. The Hermes II was home ported in Craig. The Hertha had only a fishing seine on the back deck. She was valued at $8,500 at the time of the loss with no cargo and no insurance. HETTA (1987) The 83 foot fish tender Hetta stranded and sank January 16, 1987 off of Whale Head Island on the west side of Prince of Wales Island. All three crewmembers made it to the beach where they were picked up by another fishing vessel and taken to Round Island. They were rescued at Round Island by a U S Coast Guard Helicopter. HIAWATHA (1936) The 8 ton gas screw fishing vessel Hiawatha foundered in rough seas at 5 p.m. Thursday May 14, 1936 about one and a half miles off Caamano Point. The two person crew survived the tragedy, but the Hiawatha, valued at $800 and her 7300 pound cargo of fresh salmon, valued at $359 were lost. There was no insurance. The vessel’s last port was Myers Chuck and destination Ketchikan. HIGHWAY (1943) The gas boat Highway was lost while towing the barge Mercer No 1 March 5, 1943 in Lynn Canal near Ralston Island. Wreckage of the Highway was found near Ralston Island and the barge was located on the beach at Lena Point. Six or seven crewmembers were lost in the disaster. HILDA (1931) The 10 ton wooden gas screw Hilda parted an anchor line and foundered on the rocks at Cape Ulitka at 2 a.m. June 20, 1931. Owner and master Albert Johnson of Craig was the only one aboard at the time of the casualty. John Eckloff took Johnson off the wreck. It was a moonlit night with 25 per hour winds and high seas. The Hilda was valued at $1,000 no cargo and no insurance. HILDA (1959) The 10 ton 36 foot wooden gas screw fishing vessel Hilda foundered in August of 1959 near Saint John Harbor on Zarembo Island. HILSEN (1951) The Canadian halibut fishing vessel Hilsen caught fire and sank July 29, 1951 off of Forrester Island. A short in the ignition was reported as the cause of the blaze. The crew of four barely had time to abandon ship to a dory. The Hilsen was carrying 3,000 pounds of fresh halibut. Alaska fishing vessel Denny Joe rescued the survivors including skipper Peter Ivarson of Vancouver, his father Arne, Einer Hanberg of Prince Rupert and Alfred Carlson of Digby Island. HOLDAL II (1922) The halibut boat Holdal II struck a rock and foundered March 10, 1922 at the entrance to a harbor on Bushy Island. The crew made it to shore. HOME (1979) The 33 foot sailboat Home stranded and broke up in the surf February 14, 1979 off the southern tip of Long Island southwest of Ketchikan. The family of four that was on the vessel survived in the wilderness over a month before being rescued. Elmo Wortman (53), Cindy Wortman (17), Randy Wortman (16) and Geana Wortman (13) suffered severe frostbite and hypothermia when finally rescued. The Random House book Almost Too Late details their ordeal. HOMER (1919) The 34 ton gas screw Homer caught fire and was lost at 1 a.m. October 1, 1919 in Security Bay. The three men aboard barely escaped to the gas screw Milleville which was lying alongside when the fire broke out in the engine room of the Homer. The Homer, valued at $12,000 was damaged $6,500 and her two ton cargo of fresh fish valued at $250 was lost. HOOVER (1995) The 62 foot wooden longline halibut fishing vessel Hoover ran aground and broke up in the surf September 25, 1995 a mile north of Shoal Point, Kruzof Island. All six crewmembers were rescued. A salvage attempt was made but failed. HORNET (1975) The 48 ton oil screw Hornet foundered December 13, 1975 near Lincoln Rock in Clarence Strait. HUNTER (1914) The 6 ton wooden gas screw Hunter was forced onto the beach by a tidal eddy at 12:30 p.m. Wednesday October 21, 1914 at Salt Chuck, Traitors Cove . Otto Houcken of Ketchikan was the only one aboard on a trip from Ketchikan to Traitors Cove. Houcken survived but the Hunter, valued at $600 was a total loss with no insurance. James Greenslate assisted with the gas screw Lkunk. HUNTER (1917) The 8 ton 32 foot gas screw fishing vessel Hunter foundered in Taku Harbor October of 1917. The two persons aboard were lost with the vessel. HYPERIEN (1961) The 18 ton 43 foot wooden oil screw fishing vessel Hyperien foundered September 23, 1961 at Bartlett Cove in Glacier Bay.